President’s Committee on the Arts and the Humanities, 400 7th St, SW, Washington, DC 20506. (202) 682-5409, pcah.gov. The Turnaround Arts Initiative sits within the larger context of a national school reform landscape in the United States. At the federal level, several initiatives focused on the lowest-performing schools as a part of the broader strategy. These included the reauthorization of the Elementary and Secondary Education Act in the form of the No Child Left Behind Act in 2001, and the U.S. Department of Education’s Race to the Top Initiative and the School Improvement Grants (SIG) program in 2009. SIGs are large, 3-year federal grants that target the bottom five percent of schools in each state. They are awarded competitively to states to be used in persistently low-performing schools. Schools are required to use one of four relatively prescriptive intervention models to receive the grants. The premise of Turnaround Arts is that, used strategically within this context, arts education offerings can provide school leadership with powerful levers to support the turnaround process. In particular, the program focuses on improving school climate and culture, deepening instruction, and increasing student and parent engagement, as a pathway to improved academic achievement. Turnaround Arts is built upon the principle that successful use of high-quality arts education in school turnaround must mobilize a set of core assets or “pillars” to target broader school objectives. The Turnaround Arts pillars include a focus on: 1) principal leadership, 2) the strategic use of arts specialists, 3) non-arts classroom teachers integrating arts into core content, 4) the use of teaching artists and community organizations, 5) the engagement of the district, parents, and community, 6) strategic arts planning, 7) professional development, and 8) improvements to the school environment. Each of these pillars can be used as levers for broader school improvement, targeting challenges commonly experienced by chronically low-performing schools, such as low student engagement, negative perceptions of the school internally and externally, and low trust. This report is the culmination of a two-year evaluation of Turnaround Arts, which was conducted via a pro-bono agreement with Booz Allen Hamilton. 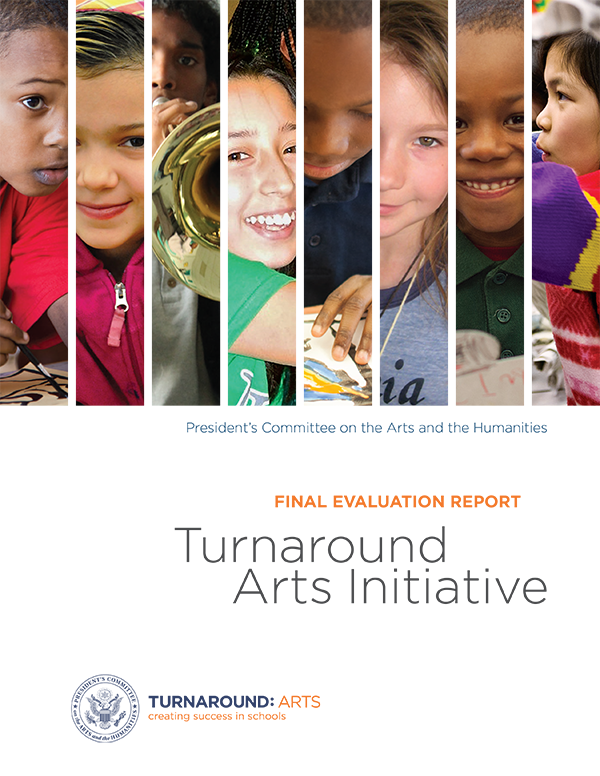 The purpose of the evaluation is to summarize the theory of action and programmatic approach to Turnaround Arts, to capture descriptive aspects of the use of the arts in school improvement, and to evaluate the hypothesis that strategically implementing high-quality and integrated arts education programming in these schools adds significant value to school-wide reform. The evaluation relies upon a broad set of data including school surveys, interviews and focus groups with school staff, classroom observations, and analysis of attendance, discipline, and student achievement data.